Since the dawn of Cracker Jacks, man has been coating popcorn with all sorts of strange crap. And whether it’s melted sugar (caramel), melted fat (butter), salt reduction (cheese), or a combo bucket bursting with this top-of-the-food-pyramid trifecta, additions to popped corn are usually A-okay. After all, popcorn is nearly flavorless to begin with, so it should be versatile enough to catch whatever’s thrown at it. It seems that one student at the University of Missouri-Columbia is putting that last part to the ultimate test, pairing popcorn with the flavors of its usual partner: booze. A.V. Club reader Abbie Brown contacted the Taste Test Action Squad about Mizzou’s Pub-Corn, available in beer, Irish creme, and piña colada flavors. Adventurous popcorn eaters can order single bags or a three-flavor sampler pack. Taste Test Hot Shot Josh Modell chose to go the latter route, not realizing that he’d get three full-sized bags, not three mini tasting bags. So he ordered two samplers. Consequently, our office overflowed with thickly coated corn in a variety of yellows and browns. Taste: We started with the beer before liquor, because my coworkers, for whatever insane reason, deduced that it would be the least disgusting of the bunch—and boy, were they wrong. The Pub-Corn people actually developed a surprisingly layered flavor palette with this one: We were hit first with a yeasty tingle. Then an overpowering sweetness cut in, finished by a nasty whiff of warm, skunky hops. It didn’t so much taste like beer, but more “beer flavor”; specifically, the smell and off-putting lip-smack of cleaning up after a party the night before. But even though our officemates reached for their water almost instantly, a few concluded that this one wasn’t all that bad, that they would even seek it out if they were drinking already. Irish creme, it turns out, was the tamest of all, lacking any distinct flavor whatsoever. (Though it consequently lacked any distinct offensive flavor, so that was something.) But at this point, most everyone involved with the Taste Test was getting a little annoyed. Someone mentioned that he was most looking forward to the little part of the kernel that wasn’t sugar-coated at all. Yes, unless you’re a popcorn-and-alcohol completist, Pub-Corn will make the taste of fluffy air something to relish. 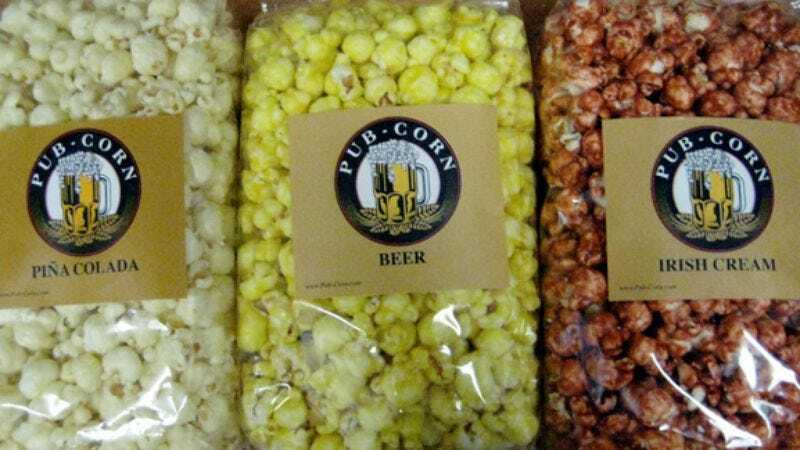 Where to get it: Pub Corn can be ordered online at pub-corn.com.